Bristol is a very exciting city to live and work in, and the South West provide countless opportunities for business and entrepreneurial success. For six exciting years, we called the Bristol and Bath Science Park “home”, but in 2018 we decided it was time for a change. Our business model is built on collaborative partnerships with our clients, and it was time to have an office that would reflect this. We were one of the lucky few businesses which secured a place in the stunning £62million Aurora office in Finzels Reach. We found ourselves in an even more exciting position to be the occupants of the self-contained Studio A office space, which gave us our own entrance and blank canvas to work with, with all the benefits of the Aurora suite; such as parking, showers and locker storage. It was imperative that we got the design of our new office nailed, so we got in touch with workplace design company, Interaction. Our brief was detailed and exciting but as does any business, we had a budget to stick to and Interaction did a superb job of delivering us a great space, on time and on budget. One key requirement for us was that the space was flexible; if somebody wanted to get up and work in another area, it would be easy to do so. This meant things like the simple integration of sockets, tidily positioned around the office to blend seamlessly. We wanted our new workplace to also be inviting for clients to come and work from as and when they please, further embedding our collaborative approach. Again, the space needed to feel comfortable to be able to set up temporarily and move around in an agile way. As a result, we had a variety of situations built into the office; from meeting rooms, to single-person private ‘booths’, open plan permanent desks and open plan seating, which can be moved around at will. Our home in the Science Park was a lovely space, but it could be difficult to take time away for lunch or more relaxed conversations as we shared the space with other tenants. Having our own office meant a permanent ‘breakout’ space was vital. The kitchen area we had designed works well in a number of ways. It has been built into the activity-based working with plug sockets, and high and low seating, but the space has been separated from the core working area. It means our employees are actually able to take time out of their day for a break, as we don’t want anyone working on their lunch break. The balance of work and down time is essential to a successful working environment. 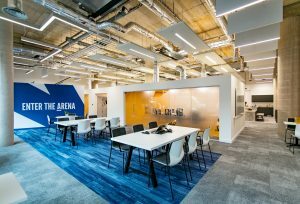 As part of our collaborative and partner-led approach, we wanted somewhere we could not only host clients to work from, but we could actually host events in – Enter the ‘Arena’. Our ‘Arena’ space is separate enough from the rest of the environment that an event can be hosted in the day with little disturbance, but also integrated well enough to allow a ‘flow’ between spaces, which doesn’t disrupt other areas. You are able to move between the meeting rooms and the kitchen or core working area without impacting the ‘Arena’, and the events space can also be viewed from the street, creating transparency and intrigue between our business and passers-by. If you’d be interested in hosting an event in our space, get in touch by emailing marketing@amdaris.com. We want to build strong relationships within the Bristol community, and are happy to offer our space free of charge to the right events.